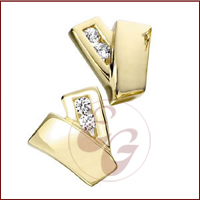 White Gold Earrings, Yellow Gold Earrings & Diamond Earrings from EGJ, leading manufacturer & exporter, India. Description: Yellow Gold Earrings with diamonds. The earrings displayed here are both in white and yellow gold, with diamonds and precious gemstones. These gold earrings are designed by the famous designers. Still you have something different in your imagination, just let us know, our talented and experienced craftsmen will make it for you. Same design is also available with other gemstones and white or yellow gold can be applied according to your choice.